In 1970-'71, and taken up again partly in 1981, there took place a scientific investigation by the most illustrious scientist Prof. Odoardo Linoli, eminent Professor in Anatomy and Pathological Histology and in Chemistry and Clinical Microscopy. He was assisted by Prof. Ruggero Bertelli of the University of Siena. *The Flesh is real Flesh. The Blood is real Blood. *The Flesh and the Blood belong to the human species. *The Flesh consists of the muscular tissue of the heart. *In the Flesh we see present in section: the myocardium, the endocardium, the vagus nerve and also the left ventricle of the heart for the large thickness of the myocardium. *The Flesh is a "HEART" complete in its essential structure. *The Flesh and the Blood have the same blood-type: AB (Blood-type identical to that which Prof. Baima Bollone uncovered in the Holy Shroud of Turin). *In the Blood there were found proteins in the same normal proportions (percentage-wise) as are found in the sero-proteic make-up of the fresh normal blood. *In the Blood there were also found these minerals: chlorides, phosphorus, magnesium, potassium, sodium and calcium. 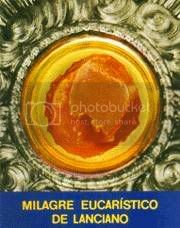 So what this means is that, unless there was some fraud very early on in the history of this miraculous Host, the Eucharistic Host of Lanciano is a small cross-section of Our Lord's Sacred Heart. And the likelihood of fraud is greatly diminished by the blood type. At the earliest known history of both the Shroud of Turin and the Eucharistic Host of Lanciano, medical science had no notion of the concept of blood types. This is because all human blood looks essentially the same even under a microscope. Blood types were not discovered until 1900, by a scientist researching why blood transfusions sometimes lead to the death of the patient. The earliest recorded references to the Holy Shroud are from the 800s. The Eucharistic Miracle of Lanciano took place in the 900s. Blood types were not discovered until at least a thousand years later. And the fact that AB blood is on both also greatly diminishes the chances of fraud. Type AB blood occurs in only 4% of the human population. That makes it the least common type of blood. Could two different medieval forgers (one in Constantinople, where the Shroud is first recorded, the other in Lanciano) have used the same type blood 100 years apart, to perpetrate two different forgeries, when they did not even know about blood types? And when the type of blood used in both cases occurs in only 4% of the human population? The chances are astronomical. Given these circumstances, I believe that the Eucharistic Host at Lanciano is in fact a cross-section of the Sacred Heart of Jesus Christ (and that the Holy Shroud was, in fact, the burial cloth of the Lord). Devotion to the Sacred Heart is essentially a Eucharistic devotion. Catholics believe that the Consecrated Host really, truly, and substantially contains the Body and Blood, Soul and Divinity of Jesus Christ. 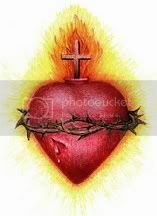 And the Sacred Heart is part of His Body. Therefore, in every Consecrated Host displayed for adoration in the monstrance, or reserved in the Tabernacle, or distrubuted at Mass or as Viatacum for the dying, the Sacred Heart is present. This link between the Sacred Heart and the Eucharist has been obvious since the beginning of the devotion. One of the conditions for the devotion to the Sacred Heart as revealed to Saint Margaret Mary is worthy reception of the Blessed Sacrament on nine consecutive First Fridays. It was while Saint Margaret Mary was in adoration of the Blessed Sacrament that our Lord appeared to her and "showed her His Heart surrounded by thorns, with a cross on the top and in a throne of flames; and then He said thus to her: "Behold the heart that has so much loved men, and has spared nothing for love of them, even to consuming itself to give them pledges of its love, but which receives from the majority of men no other recompense but ingratitude, and insults towards the Sacrament of love; and what grieves Me most is, that these hearts are consecrated to Me." The Feast of the Sacred Heart falls just after the Octave of Corpus Christi by our Lord's direct command to Saint Margaret Mary. 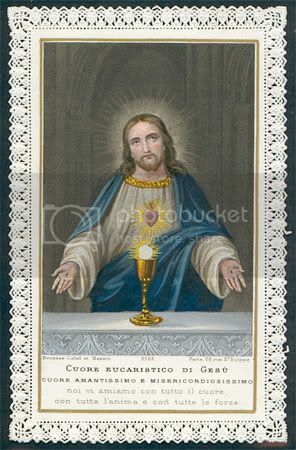 Since, moreover, the love of Jesus manifests itself to the devout soul as a love despised and outraged, especially in the Eucharist, the love expressed in the devotion naturally assumes a character of reparation, and hence the importance of acts of atonement, the Communion of reparation, and compassion for Jesus suffering. Indeed, the linkage between the Sacred Heart and the Blessed Sacrament is clear in many ways. Thus Saint Alphonsus Liguori, writing in the 18th century, treated of the devotion to the Sacred Heart in his book The Holy Eucharist. For the same reason, when I make my morning holy hour at Saint Anthony's Shrine on Arch Street, in the first floor chapel, the Tabernacle containing the Blessed Sacrament is housed underneath a statue of the Sacred Heart. 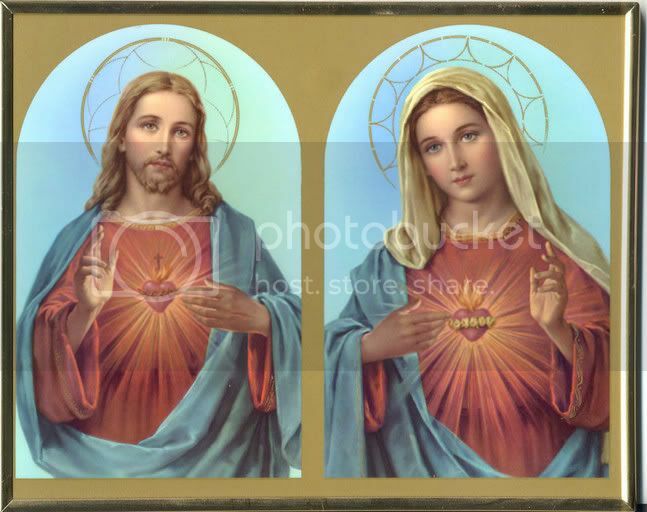 Devotion To the Sacred Heart is devotion to the Blessed Sacrament, and devotion to the Blessed Sacrament, by its very nature, involves devotion to the Sacred Heart. Inspired by a sermon heard at Sacred Heart church, New Haven, for the Feast of the Sacred Heart.